It’s hot outside today, so a barbecue is called for. To avoid heating the house up from cooking more than anything! We froze some of the notmeatballs we made last weekend, and a couple each heated through beautifully on the barbecue. 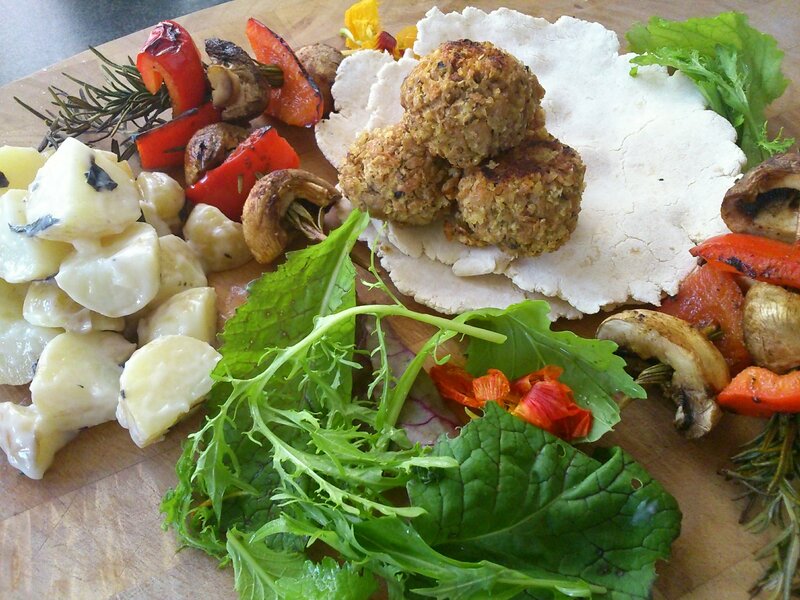 We ate them with flatbread, mushroom and red pepper rosemary kebabs, vegan basil mayo and salad. It was the best lunch we’ve made in ages! We’ll post the kebabs and mayo recipes in the next day or two. To make the mushroom and fennel powder, simply tip the ingredients into a food processor and whizz until it’s (almost) a powder. It may take a few minutes! Store in an airtight container. For the notmeatballs, first cook the millet according to the packet instructions. Drain the millet and put it in a large bowl. It should be thick and sticky. Add the nutritional yeast, tamari, liquid smoke, dried herbs, mushroom and fennel powder and salt to the bowl and mix well. Tip in the soya mince and water and mix together thoroughly. Leave to rest for at least 20 minutes, this allows the soya mince to soften. Lightly oil a baking tray. Shape the mixture into balls and arrange them on the tray. Spray or drizzle a little more oil over the top and bake them for 20 minutes. Or if you prefer you can fry them for around 12 minutes on a medium low heat, turning often. We wouldn’t recommend cooking them from raw on the barbecue, they need to form a crust in the oven or pan. But when they’re cooked through a few minutes on the barbecue gives them a great flavour. To make the flatbreads, knead all the ingredients together in a large bowl until it forms a ball. Split into 4 and roll each one out into a rough circle. Either cook in a very hot dry pan for a minute or two each side. The flatbread should bubble up a little when you cook the first side.